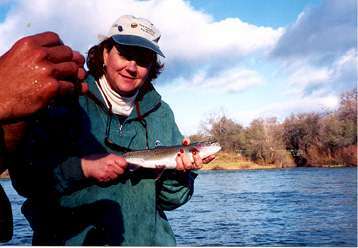 I have just gotten back from my 2nd fishing trip to the lower Sacramento this month. Without a doubt, the trips couldn't have been more different. Trip #1 resulted in only 1 small trout caught during clear and sunny skies. Last weekend's trip with Bobbi Armor provided some of the best fishing of the year in the worst possible conditions. Rain, winds, and extremely cold temperatures! We met our guide, Corey Williams of the FLY SHOP, and headed for the river. We launched on the river by the convention center, in downtown Redding. The river was at 15,000-cfs. Casting indicator and all as we floated through the first riffle, only to have the indicator disappear seconds after hitting the water, raising the rod tip at the same time hauling in slack line to find a jerky pull on the line, FISH ON yells from me and Bobbi at the same time. That was the cry of the day as we had lots of hook ups and we landed 15 fish before lunch, plus I had a 25 lb salmon up to the boat that we broke off as the season ended on the 14th of January. We encountered a hailstorm while on the river. Hail, the size of marbles, started to pelt us as we neared the Cypress Street Bridge. We used the anchor to slow our drift and used the cover of the bridge to protect us from much of the bigger hail. It didn't seem to slow the fishing at all as we each had fish on during the brief storm. The fish didn't mind the weather, but I'm sure people passing over the bridge thought we were crazy being on the water on such a lousy day. We finally broke for lunch around 2PM. 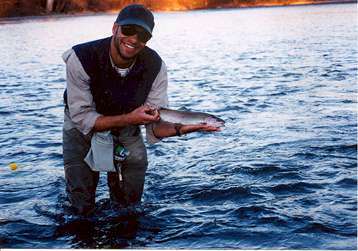 The fly was an imitation of the salmon smolt, with a bead head prince nymph situated about 12" below. We saw lots of baetis hatching and coming off the water duing the rainstorm. During lunch, baetis were floating right around the boat in a back eddy. The rainbows were coming up and picking them right off the surface like stripers do when going after anchovies in the surf, with their mouths wide open. A truly magnificent sight. We saw lots of small salmon also feasting on the baetis hatch as well. We saw lots of wildlife during the float. Bald eagles, geese - spotted, snows, lesser and Canadian. Ducks, buffleheads, egrets, and herons were also seen. They all wanted a piece of the action.